IRC chief executive David Miliband says the study shows the vast majority of Europeans have “not lost their hearts”. Hundreds of people turned out last year to call on the Government to take in more refugees. IRISH PEOPLE HAVE been ranked as the most sympathetic towards the arrival of Syrian refugees, in a poll of 12 European countries. The International Rescue Committee’s (IRC) study into public sympathy towards Syrian refugees, published today, shows almost nine out of 10 respondents in Ireland (87%) expressed some degree of sympathy towards Syrian refugees arriving here. Ireland was followed by Spain (86%), Germany (84%) and Portugal (84%). IRC chief executive David Miliband argued that the study’s findings reveal the vast majority of Europeans have “not lost their hearts”. He said there is “a clear call here for governments to combine compassion with competence in responding to the refugee crisis”. 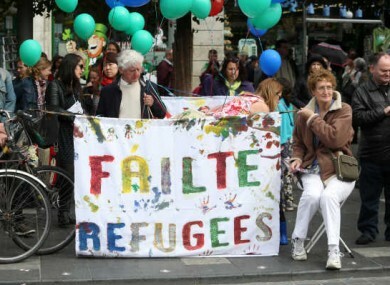 The research shows 39% of Irish people voiced concern about refugees placing pressure on the State’s welfare system, while 36% worried that refugees would put pressure on public services like education, health and housing. Over a quarter (27%) of Irish people surveyed said it would cost the Government too much money to take care or refugees fleeing the conflict in Syria. Only three out of 10 of the more than 12,500 Europeans interviewed in the study identified national security as one of their top three concerns about the influx of refugees. In Ireland, less than one in four said refugees were a risk to the State’s security. Attitudes towards refugees in the Czech Republic, Romania and Slovakia were noticeably more negative with 61% of Czechs expressing concern that refugees posed a national security risk. Some 54% of those surveyed in the Czech Republic said refugees would increase crime rates – followed by 47% in Slovakia and 41% in Romania. The survey was carried out by Ipsos Mori in August 2016 in the Czech Republic, Denmark, France, Germany, Ireland, Italy, Portugal, Romania, Slovakia, Spain, Sweden and the UK, with an average of 1,050 people surveyed in each country. The overall findings of the data show that levels of sympathy towards Syrian refugees are generally high across Europe, with three out of four people expressing some degree of compassion towards refugees. The IRC is calling for European countries to resettle 50% of all Syrian refugees or 25 per cent of all refugees globally. This means 540,000 people over five years or 108,000 per year, a number calculated by taking into account the population and GDP of each country. Ireland would need to settle a total of 6,116 refugees or 1,223 annually to meet the IRC target. Last year Ireland resettled 178 refugees. Email “Ireland the most welcoming country for Syrian refugees, according to major European study ”. Feedback on “Ireland the most welcoming country for Syrian refugees, according to major European study ”.